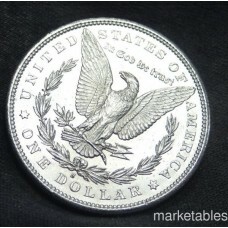 The Morgan dollar was a United States Dollar Coin minted from 1878 to 1904, and then again in 1921. 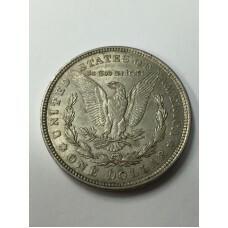 It was the first standard silver dollar minted since production of the previous design, the Seated Liberty Dollar, ceased due to the passage of the Coinage Act of 1873, which also ended the Free Coining of Silver. 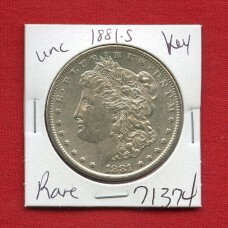 The coin is named for its designer, United States Mint Assistant Engraver George T Morgan. 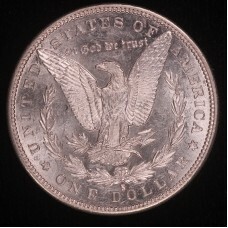 The oberse depicts a profile portrait representing Liberty, while the reverse depicts an eagle with wings outstretched. 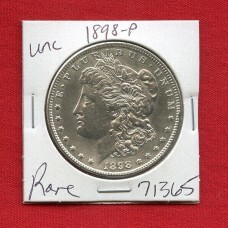 1880 S Morgan Silver Dollar Minted in San FranciscoThe Morgan Dollar was a United States dollar ..
1881 (S) Morgan Silver Dollar Coin1881 (S) USA Morgan One Dollar 90% Silver Coin Minted in San..
1881 S BU UNC Morgan Silver Dollar1881 S BU UNC Morgan Silver Dollar MS ++ Coin US Mint,..
1881 S Morgan MS63 Silver Dollar Minted in San FranciscoThis 1881S Morgan Dollar is MS63 b..
1898 P Uncirculated MS+ Morgan Silver Dollar1898 P Brilliant Uncirculated MS+ Morgan Dollar ,Rare, U..
1921 P Morgan Silver Dollar Minted in PhiladelphiaThe Morgan Dollar was a United States dollar&..